In preparation for the long awaited sequel that is sitting comfortably atop the AG hypometer, welcome to the 52nd community playthrough of Beneath a Steel Sky (or BaSS as it is colloquially known). The game is from Revolution Games, a UK developer most known for the critically acclaimed Broken Sword series. 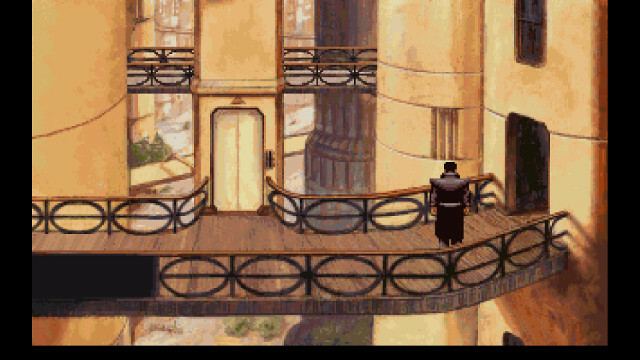 But before that series ever saw the light of day, Revolution made Beneath a Steel Sky in 1994, a title that is less known than its Broken Sword counterpart but highly regarded and loved by the critics and fans who played it. Beneath a Steel Sky is a story about the protagonist Robert Foster, trying to uncover what is happening to him and why, in a dystopian and unjust futuristic city (Union City) full of tall steel buildings. I won’t say more because I would rather you unravel the story as you play without me spoiling anything. https://www.scummvm.org/games/#sky (choose the CD Version. I believe it has the voices). The GOG version uses ScummVM internally, but it sets it up nicely in an easy to use installer, so I recommend using that if you can. The game is freeware, so whichever version you choose, it will cost you nothing. The game is a traditional point and click third-person adventure game with a very simple interface. You use the left mouse to “look at” things, and right mouse to interact with them. You can also store stuff in your inventory, and you access it by moving your mouse to the top of the screen. To pick something from the inventory you right click it, and to look at it, you left click it. You access the game menu by pressing F5. There, you can save, load or exit the game, and change other settings. The game HAS deaths, but they are rare and fair (No slipping on a banana peel and falling off the cliff). Still , I would recommend that you save frequently, especially if there is a scenario you might think is dangerous, so you won’t lose any progress. The game is illustrated by Dave Gibbons, the famous comic book artist who is best known for being the artist on the critically acclaimed visual novel Watchmen, with Alan Moore as the writer. He also drew all the facial expressions of the characters in the remastered version of Broken Sword. Alright, I got the game setup in ScummVM and ready to start. ScummVM offers you the option of running the game with the floppy disk version intro, so I’m assuming this will only affect the introduction and that the rest of the game is exactly the same…. With the introduction you already see some noticeable differences, the CD version is longer, however lacks the “Beneath a Steel Sky” banner at the end of the introduction. I believe the CD version’s introduction is more extensive and offers a broader explanation of Robert’s background. Then there is also the remastered edition, but I don’t think you can buy this for the PC and sofar I’ve only seen this for iOS devices. From a quick comparison on YouTube this remastered edition is pretty similar as the CD version, but with more animation and upgraded sound and music. Given that the original BaSS uses MIDI for music, I expect that the remastered edition has recorded music of pretty decent sound quality. This may not necessarily be better than MIDI though. With some fiddling around in ScummVM, it seems that using FluidSynth with a proper soundfont gives a pretty decent sound quality. MT-32 emulation is also available, but I thought was a bit off. Most adventure games released after 1992 usually fare better using General Midi iso MT-32. Played to the stopping point. With the game being free it has already been in my GOG library for quite a few years! I’ve now installed it & played part-way but not to the stopping point just yet. The graphics have always looked dated to me in the screenshots so I thought the game was going to look terrible on my new 24” monitor (my previous 17” just wasn’t working any more) but despite thinking that the monitor was too large anyway the game surprisingly doesn’t look that bad. The intro was interesting & immediately gave enough info I thought about Robert’s past to wonder why he’s of interest & also to wonder why his ‘family’ were destroyed. It seems as if he’s called Foster because he was fostered but really? - there was a reference to that really crap Australian lager!!! I’m still trying to work out how to access the lift - I have the ID card but wondering how to get by the retina scan. Is the game gory? I already have ScummVM installed on my computer. If I use the GOG version, will they try to install it again? No Lady Kestrel. I also have ScummVM installed but from what I understand & have experienced the GOG version already has that integrated within the game - i.e. there’s no separate installation. Okay. I’ll give the GOG version a try. I installed the plain version from GOG, and it’s working just fine. I managed to find a shell for Joey, which he doesn’t like much, and I got him to repair the tranporter robot, but that’s all I’ve figured out so far. I did notice that if Foster has to travel a long straight path, like the catwalk, it takes a few clicks to get him across. I was clicking at the far end, but he didn’t move until I clicked closer to him. Edit: While I was in Hobbins’ workshop, I found a cupboard with a sandwich and a wrench in it, but he wouldn’t let me take them. Are they something I will need later? If so, how do I get back there from the furnace room? You need to get out of the furnace room first, did you manage to do that? If yes, then you can go back to the area you were in from one of the exits upstairs. Edit: I tried both CD and floppy versions on ScummVM website. The floppy version has no voice, and it is missing the nice intro. The CD version has voice and intro, and it is identical to the GOG version so I recommend using that if you are using ScummVM. Thanks, SoccerDude! Yes, I’m out of the furnace room with an “OMG, what was that?” and new inventory items. I do like the way Foster shrugs when I try something he can’t do. I haven’t started yet, but I’ve *finally* installed the GOG version that I’ve owned ever since I had a GOG account. The GOG version also has a comic book by Dave Gibbons available as a download. Is this something we can read right away, or something to read after finishing the game, or after a certain point in the game??? It’s basically an expanded version of the intro cut-scene. I’d read it right before playing the game. It’s a nice primer and gives you a bit more context for the successive events. The remastered version has slightly updated graphics along with the comic book intro. It also has a hint system and of course a touch interface. Items you need to look at can be high lighted as well. I ended up loading the GOG version. Even though TimovieMan mentioned it, I didn’t realize that GOG had already put the game in my library. It was free, and didn’t require any futzing around with ScummVM on my part. It’s installed and I watched the intro. The only adjustments I made were to set it up for voice and subtitles. And I lowered the volume a bit. I’m trying to get used to the controls. The main problem I’m having, however, is the problem I always seem to have when playing games from this era. What may have looked enough like a fire extinguisher when viewed on an 8-10” CRT monitor doesn’t look like anything identifiable when viewed on a 28” monitor. Perhaps that’s one of the reasons Mikekelly, for example, is playing the game on a much more compact device. I’m going to give it a shot. But since I didn’t vote for it, I won’t feel to bad if it gets the better of me. I’ve taken the elevator down. Don’t remember many if any puzzle solutions but certain story moments. Both funny and sad. I managed to hit a bug before reaching the stopping point. Make sure Joey isn’t standing on the wrong side of the screen when asking him to do something in locations where other NPCs are walking around.